We are used to seeing Sebastian Vettel drive for Red Bull Racing, but his career started with Sauber. In his first GP in 2007 he replaced Kubica, who had crashed severely during the Canadian Grand Prix one week earlier. Vettel started seventh, finishing eighth to take his first World Championship point and thus became the youngest driver ever to score a point in Formula One (at the age of 19 years and 349 days). One thing became clear soon enough: that young chap was to become a class of its own! After the 2013 season we know he is not just good at doing doughnuts. 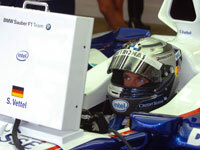 He is an excellent driver who belongs, from a statistical point of view, to the top-3 Formula One drivers. On March 10, 2013 I wrote an article called Big, bigger, biggest! The 'halo effect' in Grand Prix racing. The reason I wrote this were two lists in which experts named their favourite Formula One drivers. The first list dated from 2009 and was compiled by British magazine Autosport. They asked 217 (ex-)Formula 1 drivers to name their favourite racers since 1950. The other was a more recent list dating from 2012 (). In it members of the BBC Sport crew made their top-50 Formula One drivers list. I compared these with statistical data. I did this by collecting the classifications of all World Championship Grand Prix races between 1950 and 2012. Then I considered the factors playing a crucial role in a driver's success, asking myself what the real measures of a driver's capabilities were. The first was: drive as fast as you can, be out in front and finish. Second: be victorious. Third: be on pole. And fourth: drive the ultimate racing lap. With this in mind I alloted points to the drivers who finished in the first ten places: first place would get 10 points, second place 9 points etc., thus avoiding the varying points regulation changes during the years. I added up all of this and divided the result by the number of races. This resulted in an average classification. I did the same for victories, pole positions and fastest laps. Comparing this list with the lists compiled by the experts I introduced the 'halo effect' and the 'horn effect'. For example: in both expert lists Senna was the number one driver but in statistical terms he 'only' reached sixth position. What caused the difference? Well, everything about Senna and racing was intense, even on the brink of magic. He was an icon by life and his death in 1994 even made him 'bigger than life'. This – in part – explains the halo effect, the phenomenon that the presence of very unique qualities gives the observer the impression that other special qualities are also present within the same person. The same holds true for drivers like Niki Lauda and Gilles Villeneuve. Damon Hill seems an example of the opposite. He doesn't show in both lists by the experts. The overall judgment of his career, however, is influenced by the negative impression of being a bit of a clumsy driver, a natural loser instead of a natural winner. This is the 'horn effect', the expression coming from the 'devil's horn'. But look at the statistics: he is a top-10 driver! Of course, I know that statistical data are not the holy grail. Sports may be about figures, but figures do not necessarely fit to persons, their achievements and the impression they make. Personality, charisma and jingoism play a big part in how we evaluate people. This holds true in everyday life, but especially in sports. And what would sport be without these emotions? But still, when we want to compare achievements over time, the data tell something. Let us take a look at the situation after the 2013 season. Those who still doubted Vettel's capacities are probably silenced by now. In 2012 he was in the top-10 behind Hamilton; this year he joins his fellow countryman Schumacher in the top-3. Vettel's dominance is shown by another fact: all drivers active in the 2013 season lose a couple of places in the statistical dataset. The only exception is Kimi Räikkönen, who gains one position. According to veteran BBC commentator Murray Walker, Vettel's fame is founded on his remarkable talent to produce qualifying laps that defy belief. This is confirmed by his team mate Mark Webber (on place 48 in the list): 'We know that his strength is qualifying and the first five laps of the race. That's his signature punch. That's the hardest part to control'. Vettel has made his mark. And it makes one wonder how long it will take before he will be the absolute number one? It will 'only' take two more world championships and a string of flying laps. The Excel file shows the top-100 drivers since 1950.